Vince Locke is an accomplished artist who began work in 1986 illustrating Deadworld, a zombie horror comic that soon became an underground hit. Since then, his illustrative talents in comics have included The Sandman, American Freak, Batman, Witchcraft: Le Terreur, The Spectre, and A History of Violence, which was later made into a movie directed by David Cronenberg and starring Viggo Mortensen. Locke has also gained notoriety by creating ultra-violent watercolor paintings used as album covers for the death metal band Cannibal Corpse, and by providing illustrations for the dark-fantasy author Caitlí­n R. Kiernan. 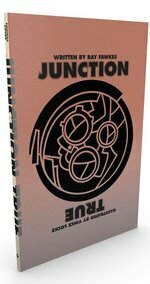 He lives with his wife and son in Michigan, where he continues to draw and paint many things, one of which being the all-new graphic novel for Top Shelf, Junction True, written by Ray Fawke!